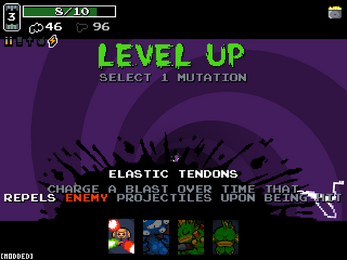 Vineskills is a mutation mod for Nuclear Throne which adds 15 new mutations to the game, including 5 of a new type of mutation, quests. also not all sprites were made by me, the good quest ones were made by "Peas"
Quest UI now works properly in multiplayer. Quest UI should be foolproof now. Heavy bolts now work properly with Pincushion Lungs. Quests can now be selected from a UI at the start of the game, rather than as a mutation choice. Elastic Tendons charges twice as fast and can grow 50% larger. Protomutant's Blessing success rate now 67% (from 50%). Hyper Hunter reduces IDPD health by 75% (from 50%) and the chance for heart attack has been increased to 75% (from 33%). Nomad's Sole accuracy and speed boost doubled, ammo increase increased 50%. Hot Pockets' pellets' damage scales faster and to a higher max damage. Mucus Dermis slows time by 4x (from 3x). All quests actually work now! Elastic Tendons, Mucus Dermis, and Musicality should no longer spit errors of "could not find any instances of 0 (Player)". Diamond Nose— Quest: Reach 4-? with Crown of Protection. Reward: Take less damage from enemy bullets. Incinerating Glare— Quest: Pick up every flame weapon. Reward: Fire incinerates enemies under 10 hp. Ionizing Soul— +2 mutations, but -1 max health at level ultra. Mucus Dermis and Elastic Tendons should no longer spit out errors. Only the latest hotfix will be available for download since previous hotfixes have broken functionality. Quests should actually work now (this time I'm actually pretty certain). Protomutant's Blessing now checks for levels above ultra too, in case you have a mod that lets you skip level ultra completely. Fixed an error involving Rocket Fists and rockets. Fixed issues involving quests actually working (hopefully). Fixed an error spat out when dying with Mucus Dermis or Elastic Tendons (hopefully). Hyper Hunter quest requirement reduced from 25 to 20. Hot Pockets chance to fire increased from 25% to 33%. Gunpowder Piercings chance to proc increased from 25% to 33%. All previous versions of Vineskills since 2.0 are now available for download on this page. Rocket Fists— Explosives will carry a damaging punch with them, dealing damage so small enemies won't detonate the explosive. Rocket Fists was made as a mutation to combat the age-old problem of your nukes blowing up in your face because a maggot walked up to it, so hopefully it actually works for that situation and offers a nice way of making explosives more viable. I finally touched this mod after like a year, neat. Elastic Tendons should actually work properly after getting revived in co-op. If it doesn't, ping me on discord or whatever and maybe I'll get to fixing it in the next year. Perfect Storm's kill requirement decreased from 30 to 5. I'm stupid and didn't realize just how rare these things are. You should now be able to complete the quest in loop 1 with CoB and decent RNG or loop 2 without CoB and average RNG. Mucus Dermis— Briefly slows down time when you get hit. I liked the concept of a "bullet time" defensive option so I spent almost 2 hours just trying to make this thing work properly (because damn did it not want to work). Could potentially need a buff in power or effects if it ends up too similar to Elastic Tendons. Nomad's Sole, Hyper Hunter and Perfect Storm all have new buttons/icons thanks to Peas (praise be). Hyper Hunter's bonus IDPD damage increased from 33% to 50% and has a chance to give non-elite IDPD a heart attack (probably from eating too many donuts on the job), killing them instantly on spawn. All quests now display their progress upon hovering over them in the HUD. Changed a tad bit of code so bad things don't happen in the future. Musicality no longer spews out numbers upon picking it (whoops, I had left trace(Musicality) in there for debugging!). Elastic Tendons no longer makes your game lag to hell (thanks Saniblues for pointing out the fact that I was creating a CustomDraw every step). Error messages showing after exiting while having Elastic Tendons should be fixed (hopefully). Hot Pockets received a large buff. (see below for additional notes). Musicality now works properly with Steroids (have fun with 'roids bullet builds!). Hot Pockets was a pretty odd mutation due to it's RNG. Gamma Guts isn't often picked, so Hot Pockets was meant as a similar, more interesting mutation. However, it was inconsistent and didn't deal enough damage. The changes in particular are as follows: The rate at which the pellets are fired out has been doubled, and the damage of the pellets scales with level (at level one, 1 damage pellets, at level 5, 3-2 damage pellets, and 6-4 damage pellets at level 10). Hopefully, the mutation is put in a better, more usable state with these changes. Mucus Dermis removed (kinda broken and also replaced in usage by Elastic Tendons). Seeking Bliss removed (Who ever picked this useless mutation anyway?). Protomutant's blessing has a new icon courtesy of "Peas". Pincushion Lungs now affects seekers fully. Gunpowder Piercings— Bullets have a chance to explode on death. 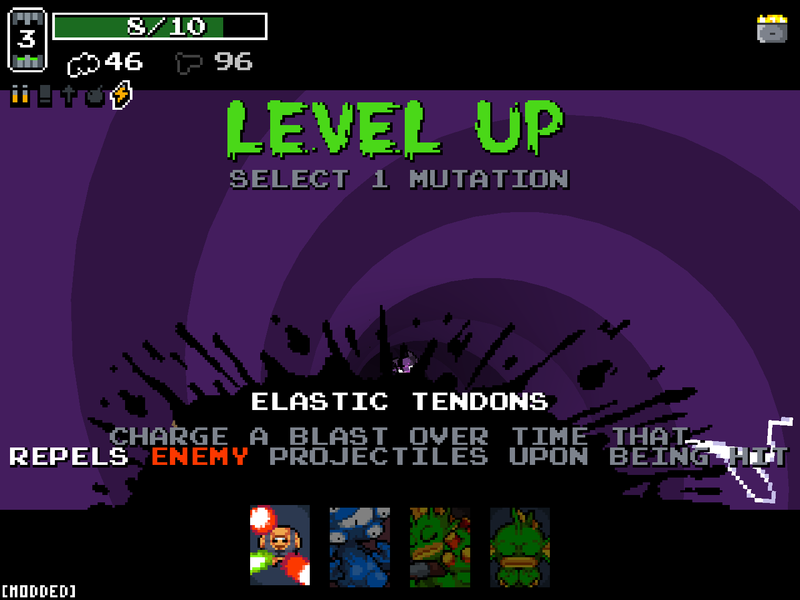 Elastic Tendons— You slowly charge a blast that repels enemy projectiles upon getting hit. Hot Pockets— Fire pellets will constantly occasionally spew out of you (they are affected by mutations that affect flame pellets too). Musicality— Firing the same weapon within a moderate frame of time after reloading it reduces it's cooldown. The cursor doesn't quite reach the quest selection when using a controller. It requires you to switch to mouse and keyboard in order to select.